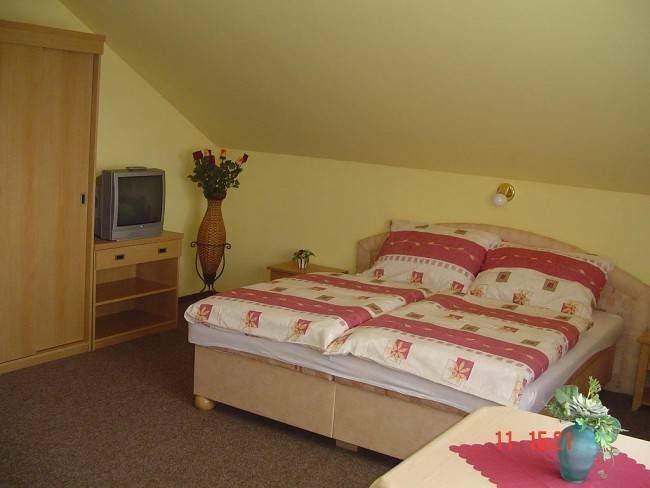 Cesky Krumlov, Pension Axion ... Very pleasant B£B, friendly people, superb breakfast. Minor point is the location, about 1hour walking to Cesky Krumlov and no frequently busses in the area. 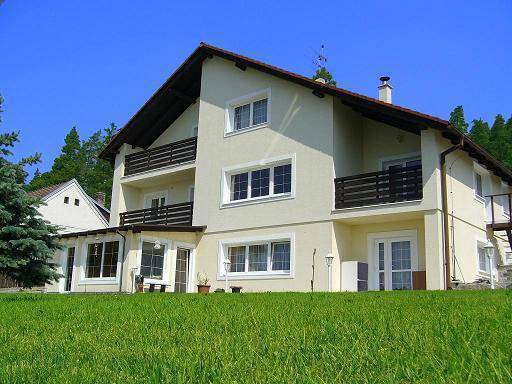 Pension Axion is situated both in a peaceful suburb of Cesky Krumlov and protected landscape area of Blanský les. No industry or heavy traffic makes it an ideal place for relaxation. The pension is located in breathtaking nature, surrounded by deep forest, but still within an easy reach of the historical centre of Cesky Krumlov, where you can enjoy the cultural life and lively atmosphere. 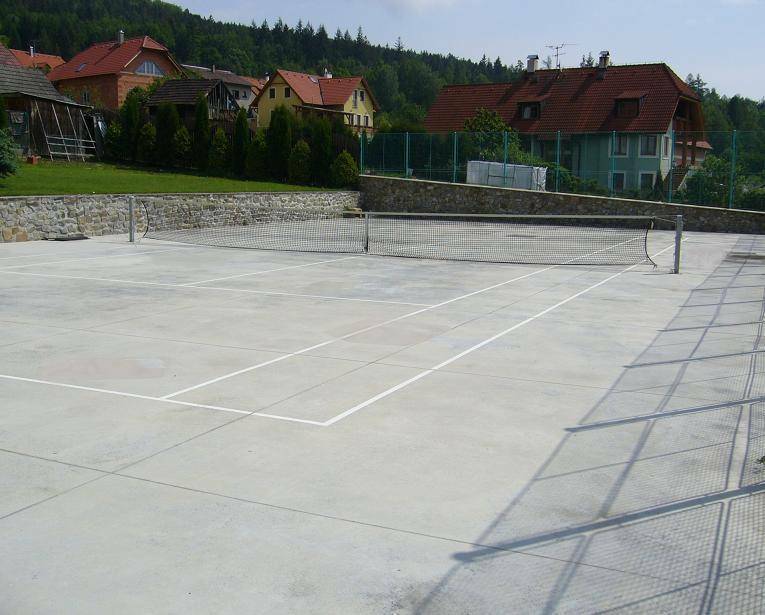 You can also visit various sport facilities and make trips to other historical sights of South Bohemia. Our pension offers comfort in modernly equipped interiors, a restaurant with a fireplace or a romantic dinner on our terrace under the bright sky covered with shining stars. To active guests we can offer a tennis court or body massages. High speed internet is provided in every room for FREE and we can also arrange a transfer from the Cesky Krumlov train station at no cost. A safe parking place is situated in the area of our pension. Our pension is suitable for weddings and company celebrations. Sport There is a tennis court right in front of our pension. Also, as our pension is located just a few meters from the area of Blanský les, there are many tourist and bike routes. Not only Blanský les, but the whole area of South Bohemia is suitable for tourist activities. We will be happy to arrange bike rental for you. 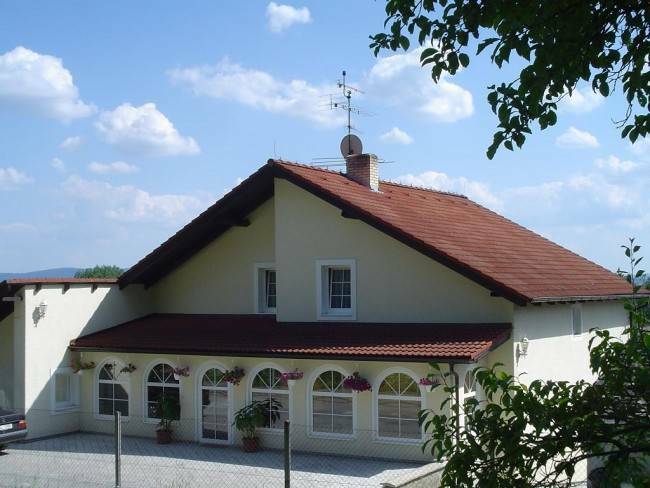 For horse lovers, we can book a horse ride in a near village Slupenec. The river Vltava and Lipno dam A canoe or boat rental is possible as one of the best views of Český Krumlov is from the river. We will arrange everything including transfers. Possible route: Vyí Brod Český Krumlov Borov nad Vltavou. The Lipno dam is 40 km far from Český Krumlov. It is a good location for sunbathing or relaxation in the hot summer weather. Sights The second largest castle in the Czech Republic is located 3 km from Pension Axion. The medieval castle, as well as the whole historical centre of Český Krumlov, is on the UNESCO list. We would be happy to guide you through the town and if you are interested in history, you can see the interiors of the castle as well as one of the oldest baroque theatres in Europe with the castle guides. Being one of the cultural centers of Southern Bohemia, you can visit many galleries, exhibitions and museums for example Museum of torture, Wax museum or Egon Schiele Art Centrum. Former graphite mines have also been reopened for public. In the surroundings of Český Krumlov you can find castle ruins Dívčí Kámen hidden in the forest, the oldest mountain view-tower in Europe Kleť or a stunningly beautiful castle Hluboká nad Vltavou, where you can also visit the Zoo. Winter In the winter you can combine visiting the beautiful town of Český Krumlov with skiing or snowboarding in the ski area Lipno Kramolín with a cable railway, more than 5km of ski routes, snowpark and a foxpark for children. We can arrange the ski equipment rental, instructors and transfer. This location is also suitable for cross-country skiing, because you can either use the Kramolín routes, or the frozen Lipno dam. 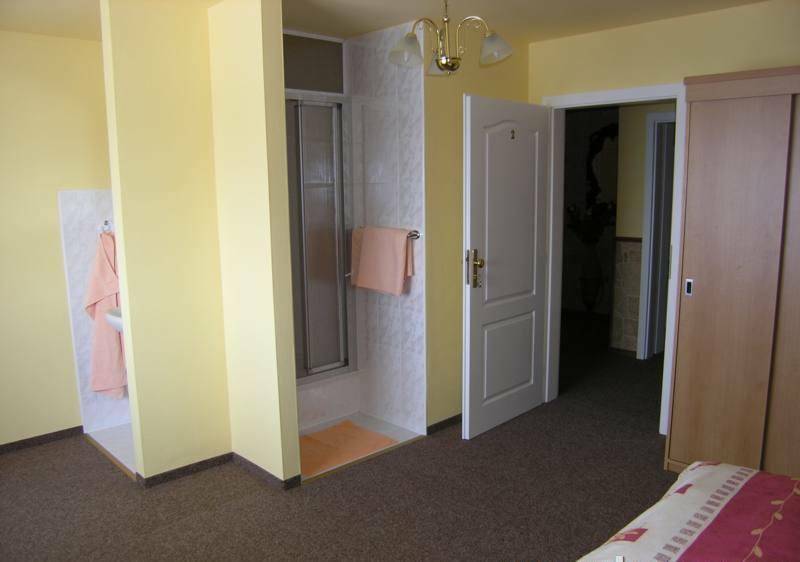 The pension offers 4 double-bedded rooms with separated social facilities (WC, shower) and the apartment for 6 - 10 persons with the kitchen and bathroom with the bath. For guests is at disposal large common room with TV and bar. Here is possible to play chess, cards and table round games. 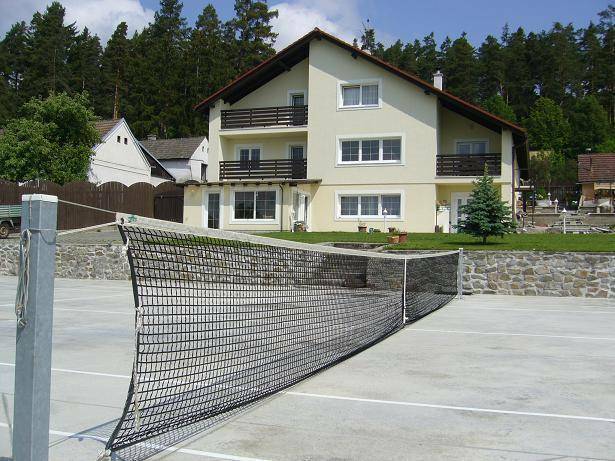 In the property you can find tennis court and nice outdoor gathering at the open fire. Price of accommodation includes breakfast. We offer possibility of dinners orders. Here are ideal conditions for arrangement of actions for private society or suitable for family recreations, couples, individuals, commercial dealing in calm place, accommodation for business trips. Parking area for your car is situated direct in pension area. No pay for reservation. You could pay after staying. 3, 5 km from the historical center. Free transport from the station.